Nicolas M Kyvernitis Enterprises (NMK), audio, video and communication distributor in the Middle East has supplied QLX-D Digital Wireless System to Oman International Electronics & Trading Co. LLC (OHI Electronics) based in Oman. 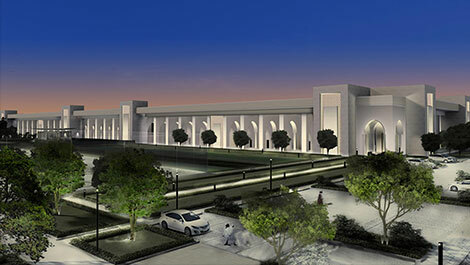 OHI Electronics was appointed to install QLX-D System by the Royal Court Affairs at Sultan Qaboos Youth Complex in Salalah, Oman. OHI Electronics, the prestigious AV company, availed this opportunity to execute the complete AV system in this project. Shure technology was used in all the areas such as multipurpose halls, sports halls, swimming pool areas and other areas. The QLX-D is Shure’s addition to its growing line of digital wireless microphone systems and utilises some of the technology developed for the company’s higher-end Axient products and ULX-D Series to good effect. Typical applications for QLX-D are corporate events, live music, higher education campuses, houses of worship, hotels, conference centers. For a corporate installation, the system would be perfect solution, if all the receivers are on the same floor and/or use the same Ethernet network. For live music, QLX-D would be suitable for a small or medium-size concert hall. “We were looking for a digital-based solution and QLX-D was the most compliant product with the specification. The system’s main purpose was for speech transmission. Moreover, the whole system was on the same network/same floor and QLX-D was the best solution,” commented Mr. Usama Iqbal from OHI Electronics. Oman International Electronics & Trading Co. LLC is a subsidiary of the OHI Group of companies, one of the largest business groups in Oman. The company holds an enviable position as a pioneer in the electronics industry for over 30 years in Oman. The major divisions of OHI Electronics are Audio Visual, PAVA, Digital Signage, Professional Indoor &outdoor Displays, IPTV, SMATV SECURITY, GRMS and retail. “Based on our satisfaction we would definitely recommend QLX-D Digital Wireless System. It is a very cost effective solution, and technically suited for most projects. We’ve been partnering with NMK for a quite few years and we are satisfied with their quality of products and timely services.” he added.